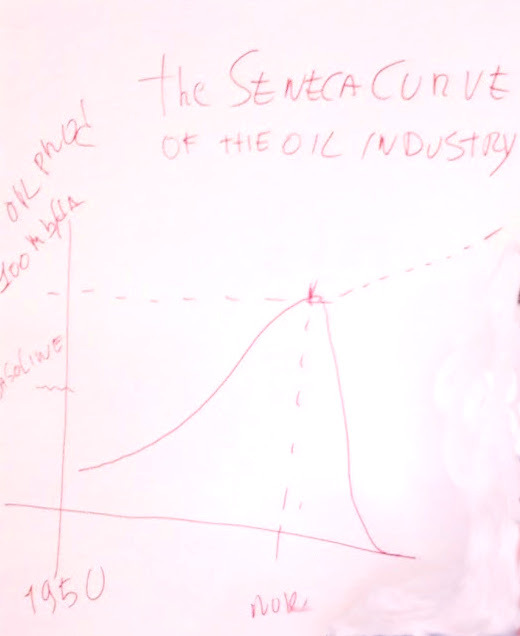 Cassandra's Legacy: The Soft Belly of The Oil Industry: an Upcoming Seneca Collapse? 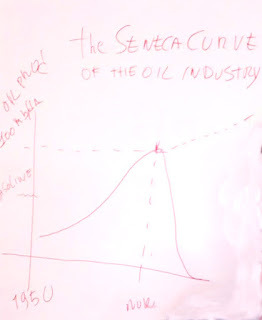 The Soft Belly of The Oil Industry: an Upcoming Seneca Collapse? Ugo Bardi explains his idea of an impending "Seneca Collapse" of the world's oil industry at the session on climate change of the meeting of the Club of Rome in Vienna, on 10 Nov 2017. What follows are not the exact words said, but a text which maintains the gist of this brief comment. It was focused on the concept that the oil industry has a "soft belly" in the fact that it produces mainly fuel for engines used for transportation. If this market were reduced by the introduction of electric vehicles and other transportation innovations, the whole industry could collapse. That would be a good thing for the earth's ecosystem and for humankind in general. 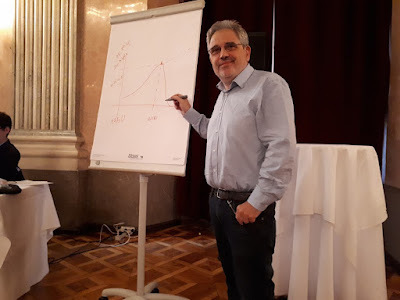 Dear colleagues, we are having an interesting discussion on how to stop climate change and I think I could add some thoughts of mine on the basis of my recent work that I published in the form of the book titled "The Seneca Effect". So, can we take the opposite approach? That is, look at the demand side in a "bottom-up" approach? 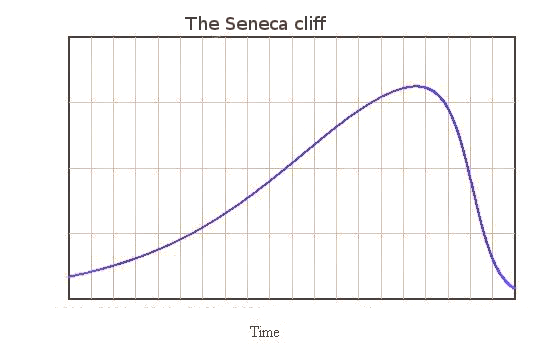 To discuss this point, let me introduce the concept of the "Seneca Effect" or the "Seneca Cliff." 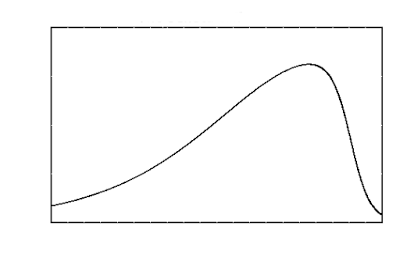 Here is the shape of the Seneca curve. You know that I use the term of "Seneca Effect" taking inspiration from something that the Roman philosopher Seneca said long ago; "growth is sluggish but ruin is rapid". And you see how the curve looks like the projections for emission reductions we have been seeing here. 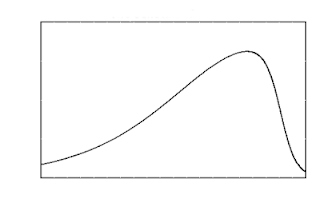 So, the question is, what causes the collapse we see in the Seneca Curve in complex systems? Well, we can use system dynamics to model the collapse and we know it is not a "top-down" effect, nobody from outside forces the system to collapse. It is a very general phenomenon caused by the interactions of the various elements that compose the system which cooperate to bring it down. And that's a trick that can be exploited: as I say in my book, "The Seneca Effect", collapse is not a bug, it is a feature. Let me see to explain it using the oil industry as an example: see the figure drawn on the board. Now, you see the segmented line I drew, it keeps going up. It is what the oil companies expect for the future. Their projections, by Exxon for instance, say this: given sufficient investments, we can keep growing the oil production for a number of years, maybe a decade or more. That's what they have been doing; despite various dire warnings, the oil industry has been able to keep production growing. It is true that conventional oil ("crude") peaked at some moment between 2005 and 2010, but it didn't really decline. Then, the production of "all liquids" kept growing by exploiting other sources such as shale oil. Of course, the problem is that if the industry continues to make an all-out effort to increase, or at least maintain, production, all we were saying about the need of reducing emissions goes out of the smokestack. Forget about keeping warming below 2 degrees. It would be a disaster. But look at the Seneca curve in the graph. It would generate more or less the kind of rapidly declining production curve we need for our future survival. The oil industry doesn't predict anything like that, but it is vulnerable, very vulnerable. The industry has a "soft belly:" the collapse of the demand. That is, we don't need governments to enact draconian regulations: if the market for a product disappears, then the industry producing it will disappear. Can it happen? Yes, it can. The key point of the oil industry's vulnerability is in the need of large investments to keep the whole thing moving. Facing increasing production costs, they have been able to survive by growing and exploiting economies of scale. This has been possible because investors thought they were investing in a growing industry. But things have been changing and the market of the oil industry is at risk. Consider that typically a good 50% of the oil industry production is gasoline. To this, you may add about 20% of diesel fuel and the result is that some 70% of the output of the industry is for internal combustion engines used for transportation. So far, this has been a growing market, but the electric transportation revolution is coming, and not just that. There is a whole systemic change under the concept of "Transportation as a Service" (TAAS). The combination of the diffusion of electric vehicles and the optimization of the system may rapidly reduce the demand for gasoline and diesel fuel. We don't need a large reduction in the demand for transportation fuels to generate a spiral of decline for the oil industry. Less demand means less production, less production means the loss of economies of scale, and the loss of the economies of scale means higher costs that translate into higher prices which also depress the demand. And so it goes until it reaches the bottom. As Lucius Annaeus Seneca said, long ago, "ruin is rapid". And the ruin of the oil industry is not a bad thing for the earth's ecosystem and for us all. - According to this interpretation, Elon Musk is the most subversive person in the world. Also, the most subversive thing you can do, nowadays, is to buy an electric car. In my case, I drive an electric motorcycle although I must confess that I still have and drive an old hybrid, not yet a fully electric car. I hope to be able to do better in the near future. - Did you ever ask yourself why Elon Musk and his company, Tesla, are so ferociously and continuously attacked everywhere? Well, read the note above and you'll understand. - The "soft belly" phenomenon described here is relative to the oil industry, but it doesn't apply to the other two sectors of the fossil fuel production: coal and gas, which produce mainly electricity, not fuel. At least, it could avoid the true catastrophe that would occur if someone were to decide to move toward technologies such as "coal to liquids" and "gas to liquids." - A similar concept to the one discussed here, demand management ("bottom-up) as superior to supply management ("top-down") has been described by Carolyn Hansen and Raj Thamotheram in a recent draft article which appeared on linkedin. What people can afford becomes a barrier on the complexity of transport. An electric buggy based on bike technologies, but build on a large scale could be so affordable most of us poor folk could not pass it up. I doubt the laws would ever change to allow such a thing. Very good. Would the economy around the collapsing oil industry heal fast enough to prevent a nasty propagation? I'm still wondering how much diesel we can replace with batteries, and how fast. This article looks at the demise of the oil industry, and its gasoline derivatives as if it can be taken in isolation, and leave the rest of our living system unscathed. This seems very odd---it is going to happen of course, but not in the sense that, sans gasoline, we are all going to enter some kind of utopia where we will be better off, fitter, happier etc etc. it is the economy of scale (which includes the market for gasoline) that gives us our oil supported environment. There is nothing in our mode of existence that does not contain within it a component of oil coal or gas. Anyone doubting that should examine any object with reach, and check its origins. There is no substitute for the manufacture of those objects, no substitute for the employment they provide. Remove oil and there will be no purpose for journeys. So there's your transport problem solved. Humankind has pulled off the neat trick of turning oil into food. Remove the mass market for transport gasoline and the cost of (for example) tractor fuels will be so high as to be unusable. Apparently it is---until those who advocate this discover that their food supplies have been cut off because farms cant produce food or transport it. And no--there are no alternatives. Electricity cannot drive farms, deliver food or stock supermarkets on the scale that 7.5bn people need it. EVs, as of this moment, comprise I believe 0.01% of global transport. Scaling up would be colossal even if it were possible within the timeframe we have left. So much for the elimination of the IC engine. Windfarms and solar farms are promoted as providing enough energy to power xx000s of homes---all well and good. nobody dares to point out that the environment in which those homes sit consumes fifty times as much power. Which confirms the nonsense of our future "wind powered utopia". Of course, it is unlikely that the collapse of the oil industry will have no consequences on other sectors of the system. If nothing else, it will take with it the gas industry, which is part of the same industry, uses the same kind of equipment, employs the same kind of personnel, etc. And the collapse of a huge segment of the productive system will likely create ripples in every sector. Yet, I think one could also make the case that the disappearance of the oil industry doesn't necessarily mean the end of the world as we know it. I have in mind "Who Framed Roger Rabbit?" One of the subplots of the movie was that the car industry conspired to destroy the tramway industry. It is probably true, at least in part. It happened. But the collapse of the tramway industry didn't generate disasters; trams were simply scrapped and that was it. Now, admittedly, we are discussing of quite different sizes but, in principle, a managed Seneca collapse can occur in a relatively smooth manner. the scrapped tramway system in the USA is an interesting example of our situation. it's important to recognise the timescales involved with that. When the trams were scrapped in the 50s, land was cheap, housing developments were spreading ever outwards, and everyone wanted cars and thought that individual transportation was the way of the future---which of course it was, but only for another 60 years or so. Scrapping trams increased demand for cars. That provided more jobs within the industrial system that provided the financial infrastructure to create the housing sprawl. It was a self generating system that was supposed to go on forever. But electric vehicles need resources and energy to manufacture, and those resources and energy are being delivered by oil. Can they be delivered without oil? Elon Musk is not subversive; he's out to make a profit before people realise that electric cars are not going to be part of the long-term future. "Growing your own food is a subversive act" (Bill Mollison of permaculture fame). Now THAT really is subversive! The giant expansion of the electricity industry seems highly problematical to me. Yvan Roy has a point: you could propagate a number of simultaneous Seneca cliffs. Meanwhile Tom Whipple over at Peak Oil Review reports a most extraordinary projection. Quote: Last week the IEA shocked the oil markets when its annual World Energy Outlook predicted that US shale would dominate the oil and gas markets over the next decade, rising to “a level 50 percent higher than any other country has ever managed.” With a “remarkable ability to unlock new resources cost-effectively,” US shale resources will add millions of barrels of new oil supply by 2025 and contribute more than 80 percent of the growth in world oil production during the next seven years. US shale oil production, which includes crude, condensates, and natural gas liquids is now forecast by the IEA to increase to 13 million b/d by 2025, out of total US output of 16.9 million b/d – roughly 7 million b/d day higher than current US production. What happens after that, IEA presumably does not say. Well, if the IEA is right we get to eat for an extra decade before we begin to slow cook. That is a good thing, right? I would like to add (and I'm sure everyone here knows) that the already large oil industry is expanding at a frantic pace right now. "Energy sprawl" I think some are calling it. In any case, it is sucking massive amounts of capital and labour out of the rest of the economy at an exponential growth rate. If it does die, whatever the reason, the bigger it is the more likely it will possibly take something else down with. All things being equal I do believe that a transition to EV transportation could happen. It would just like all other transitions though in that it will take a generation or so and would not mean the end of FF use or even much of a decline. In order for the transition that you posit to occur and to displace FF use the world economy would have to stand still or even decline which would cause so much chaos that EVs would not matter. I too wish we could simply proclaim something to be true and just move on but reality keeps rearing its pretty head. without employment, as created by fuelburning, there will be no point in making journeys anywhere. And we have no other means of creating employment other than by burning fuel. Oui, foodnstuff a reason, ça c'est la subvertion ultime. Et j'avais pas pensé a Jevons... Wait I guess I could write in English! Yes Foodnstuff is right, that is the ultimate subversion. I hadn't thought of Jevons, he is a bit of a pest sometimes. Pas exactement comme ca. Jevons a souvent raison, mais ici on ne peut pas appliquer sa theorie. On ne parle pas d'une augmentation de la disponibilité d'énergie. C'est une transition; une autre chose. Lisez Wikipedia! Oui, mais si on réduit la demande (par l'auto électrique) on libère une partie de la production du pétrole, et ça réduit son prix, non? En même temps les véhicules à moteurs à combustion deviennent progressivement plus efficaces, comme les moteurs à vapeur de Watt versus ceux de Newcomen. Donc une deuxième sorte de réduction de prix? Si je comprends bien et pour simplifier un peu trop, qui dominera Jevons ou Hubbert? Allez-y, les mecs. Ce n'est pas exactement comme ça. Jevons disait simplement qu'une augmentation de l'efficacité d'une technologie n'amène pas à une baisse de la demande. Si on l'applique au voitures, bon, on peut dire que si on achète une voiture qui consomme moins d'essence on fera plus de kilomètres et ça revient à la même chose. C'est à dire, la demande d'essence ne change pas. Oui, mais ici c'est différent: on peut faire un million de kilomètres avec une voiture électrique, mais la demande d'essence remains zero. C'est une chose totalement differente. Certainement on peut dire, "Bon, mais le pétrole pas utilisé pour produire des carburant pourra être utilisé pour produire de l'électricité". Mais non; pas possible. L'électricité produite avec le pétrole c'est hors marché; trop chère. Vraiment, l'industrie pétrolière va se retrouver sans un marché pour ses produits. C'est comme l'industrie des tramways quand ils ont été remplacés par les voitures privées (souvenez vous du film "Who Framed Roger Rabbit"?). On a pas utilisé les vieux trams pour autres choses quand ils sont devenus obsolètes. On les a simplement jetté. Et ça c'est le destin de l'industrie du pétrole. Bon je crois qu'on a compris, après l'âge de la pierre l'âge du bronze puis l'âge du fer, puis l'huile des baleines puis le pétrole etc... jusqu'à la merveilleuse Tesla dans mon garage. Je remarque que de progrès en progrès nous saccageons de plus en plus la planète jusqu'au moment où elle deviendra inhabitable. Sincèrement je pense que si nous nous engageons vers ce pari du tout électrique nous allons au désastre. Je vous invite à regarder les conférences de Jean-Marc Jancovici (il y en a plein sur youtube, ou alors allez sur son site) pour comprendre de façon chiffrée la galère que ça va être. Jancovici explique aussi très bien la décorrélation entre le prix du pétrole et le volume produit (si si). 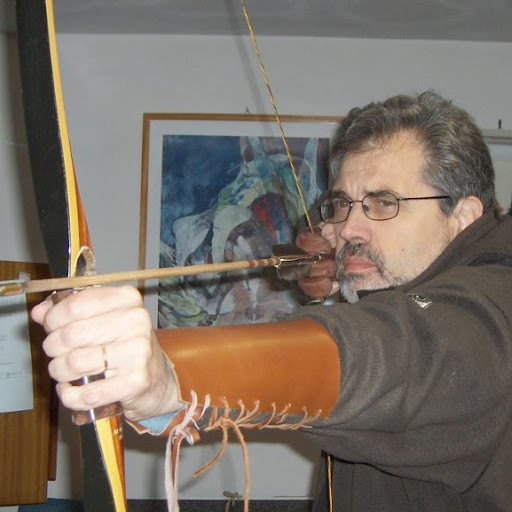 Philippe Bihouix est aussi une bonne lecture. Petite réflexion annexe: si le prix du pétrole baisse parce que nous utilisons des véhicules électriques il sera rentable d'utiliser ce pétrole pour produire de l'électricité bon marché, je remarque au passage que le pétrole est un condensé de puissance contrairement aux autres sources prétendument non polluantes. Sinon qu'est ce qui va produire l'électricité? L'éolien, le photovoltaïque, les centrales nucléaires, le charbon, le gaz? Avez-vous idée des investissements (financiers et en ressources) nécessaires? Il y a de quoi mettre notre planète à genoux et nous avec. Concernant Jevons j'avais compris ça: j'achète une voiture qui consomme 4 litres au cent pour remplacer ma vieille voiture qui consommait 8 litres. 1er effet d'aubaine: je roule plus et je consomme 6 litres au lieu de 4, deuxième effet d'aubaine: il y a 2 litres sur le marché qui sont récupéré par un industriel qui va produire plus et moi je vais aller dans ses magasins pour y acheter les nouveaux produits, donc à l'arrivée ma nouvelle voiture de 4 litres consomme 9 litres au lieu des 8 litres de l'ancienne, et nous avons contribué à saccager la planète. Unfortunately, the shift to electric vehicles may not do much to solve the climate problem either. Manufacturing an EV can generate twice as much CO2 as a conventional car and using one can actually INCREASE the output of CO2 compared to a conventional vehicle if the country where it is being used is heavily dependent on coal for its energy production. Add to that the problems of disposal and their need for extracting cobalt from DRC, they are not the simple and easy solution that many believe. Excellent list of the realities of EV. I know of many state agencies that put out press releases about how they are so pleased at the increase in EV cars and yet do not dig deep enough to see that most of those cars (and their charging stations) are run on electricity from power plants that includes fossil fuels in their mix. So when is the electric transportation revolution coming? I ride a bicycle, does that count? "L’automobile face à ses contraintes : énergie et métaux"
Musk notwithstanding, the electric car will _not_ save our bacon. Thanks, lots of good info. Yet again we see why green growth is looking more and more like a myth. Thank you Heck. Sic transit Tesla and Co.
in the uk, we have been told petrol and diesel cars will be banned in 2040, and replaced by ecars. i suspect this date has been given because the oil companies (who make policy) know extraction will be finished by then anyway due to there being too little oil to pump. do not expect much of an ecar revolution before then. the oil has to be used up first! after 2040, cars will be run on coal. A Seneca Cliff for the Web as we know it?